You have to give it to Darren Aronofsky: the man has chutzpah. He has made good movies (The Wrestler, Black Swan), bad movies (The Fountain), and just plain weird movies (Pi). But they have all been bold, creative, and memorable. Thus it is not surprising that his latest film, Noah, is bold, creative, and memorable as well. It is also, perhaps, something of a landmark — a big-budget Hollywood production that not only overtly deals with the Bible, but does so in a way that is neither sanctimonious nor sentimental. In turn, Noah demonstrates, right in the teeth of our post-religious culture, that the Bible remains a text worth contemplating and learning from. Of course, the extent to which Noah might be deemed biblically accurate is a matter of debate. Some have chided Aronofsky for taking too many liberties with the text (Genesis 6-9), arguing that he turns the great patriarch into an angst-ridden and possibly murderous protagonist. Others see it as a left-leaning picture that intends to address the problem of climate change, thereby casting Noah as an “environmentalist wacko.” Still others view it as simply “anti-Christian.” And, finally, there is the view that Aronofsky, no matter his personal beliefs, is drawing on the ancient Jewish tradition of Midrash, effectively having a conversation with the biblical text, searching (sincerely if also confusedly at times) for its underlying meaning. I side with the latter perspective. Aronofsky does expand on the source material (how could he not, given the need to produce a full-length film from a few chapters of text? ), and he certainly puts his own stamp on the movie’s aesthetic and thematic interests (again, how could he not, given that someone, somehow had to commit the text to the cinematic medium?). And yet, ultimately, the film affirms the core of the biblical message — that the universe originates from a divine creator; that the creator made everything good (a sequence that Aronofsky masterfully inserts into the narrative); that through pride, selfishness, and violence human beings corrupted what was originally good; that for the sake of this good creation (and not out of petty malice) God elected to end the old order and to fashion the world anew; that Noah and his family were the chosen vehicles for the preservation of the good; and, finally, that the upshot of the story is God’s ultimate commitment to the goodness of life (“Be fruitful and multiply.”). Needless to say, if that were all that Aronofsky conveyed, then there would be no controversy. So, what’s the big deal? The real issue — at least among Christian viewers — seems to lie less with what Noah is about and more with how it gets there. Sure, one might say, Aronofsky says some good stuff about “The Creator” and animals and love and all that, but why are there “freakin’ rock monsters” in the movie and why is Noah so damned nasty? I’ll leave the first question largely alone — in nuce, the rock monsters are known as “The Watchers,” and they come from the Book of Enoch, an ancient text that has traditionally been deemed “inspired” but not canonical by Christians — but I do have a few thoughts on the second one. Aronofsky appears to be interested in the burden of Noah’s mission. It’s a fair concern. After all, not only does Noah have to deal with the construction of the ark and the handling of the animals, but, as any other person would, he has to confront a series of devastating ethical questions. For example: Who gets to make it on his boat, and who doesn’t? And why are Noah and his family spared, when they too share the blood of Adam and Eve? Are they really better than the rest of humanity? Indeed, if they do survive the deluge, will they and their seed not simply corrupt the earth all over again? As the film progresses, these questions take a toll on Noah (a typically fantastic Russell Crowe). He grows surly, even mean. But he does not doubt God. Rather, he doubts himself and his standing before God. He is, in a sense, a victim of his own humility, so certain of his sinfulness that he can no longer perceive the deity’s loving will. Here, I daresay, Aronofsky is drawing on Kierkegaard’s pseudonymous work, Fear and Trembling — a treatise based on Genesis 22 (Abraham’s near sacrifice of his son, Isaac) rather than on Genesis 6-9. Nevertheless, Aronofsky’s Noah is quite similar to Kierkegaard’s Abraham. Both are confronted with what Kierkegaard’s pseudonym, Johannes de silentio, terms a “teleological suspension of the ethical,” that is to say, a break from the norms of human society for the sake of adhering to the will of God. Put differently, both Kierkegaard’s Abraham and Aronofsky’s Noah give priority to the will of God over human convention. Moreover, in doing so, they exemplify the spiritual trial, the sheer fear and trembling, of such a rigorous faith, and they raise the specter of what might happen if that faith were misguided. To paraphrase Kierkegaard, faith is not effortless — a mere matter of reciting a creed or whatnot — but all too difficult. It may render one incomprehensible to others, and, on account of human frailty and limitation, it may even bear so much resignation that God’s beneficent “still small voice” (1 Kings 19:12) is not heard. 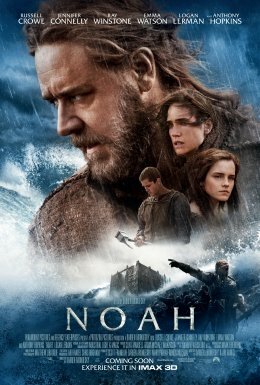 That, on Aronofsky’s telling, Noah narrowly avoids the latter circumstance is not an indiscriminate adulteration of the biblical text. On the contrary, it is a reading of the Noah cycle that is indebted to other parts of Scripture. Aronofsky’s approach may make persons of faith uneasy, but, as Kierkegaard was at pains to remind us, faith was never meant to be easy anyway.